same as ny othere RpG have fun.im sure moniters will be watching but i must admite my character has done some "DIRTY" things in his life also but nuttin bad or rude!!!! no killing people unless they say.team ups will be allowed.Evan kanos will be up soon so none will be hime until he remembers his password!!!! its a new price on Evan kanos and Devin Jax's head but will they survive. As Devin steps off his trusty veichle slave 2 on the planet Tatooine. he notices postings of a freind of his on a holo bounty list of most wanted. Hmmmm,seems that Evans got himself in some trouble wait a minute! !He looks to the holo list beside it . what!!! !I....Im...Im up for bounty, who would be such an idiot to get somone after me!! Hi Devin, just a tip. If you want to start an RPG it's best to have a setting and a rough plot started so people know what to write about. It's also good to wait until the other RPGs are receiving less posts so you get more people interested. Also it's good to use spell check so it's clear to everyone what you're character's up to. Thanks for having a go! Weapons: DC-17 with sniper and anti-armor,Virbro sword, pistol (from REP COM) yellow lightsaber, taken from jedi. actually you got it a bit off its around the time of the new rebelion or if you own the game jedi outcasts its around that time. Kal'ak was on the roof of a building, the desert's sun beating down his armor. He had recently taken up bounty hunting, untill he could afford a replacement ship. He lowered the range finder on his helmet. By pure chance, one of the bounties had stepped of a ship, a Mandal Motors Pursuer. Kal'ak checked his target. The armor was extremly identical, so unless some idiot had either got to him first and was parading around in his armor or had looked like him. But, what if its Boba Fett? Kal'ak asked himself. No way, his reaction to the bounty list was odd, and Boba wouldent even be looking at the list, he let his requests come to him. And besides, this guys taller then Boba. Kal'ak raised the sniper rifle to his shoulder, resting it on the roof's slight perimeter.But still? the question in the back of his mind persisted. He clicked the safety off. "Well," he muttered"I'll find out soon enough"
Weapons: Alo has 2X repeating blasters. wrist gauntlets with the standard (plus a carbenite thrower) AAD has all you see in the pic plus a jammer/long range transmitter (the big antenna on his head). Attitude:Like Boba's but more fun. AAD's is none he dose not talk. 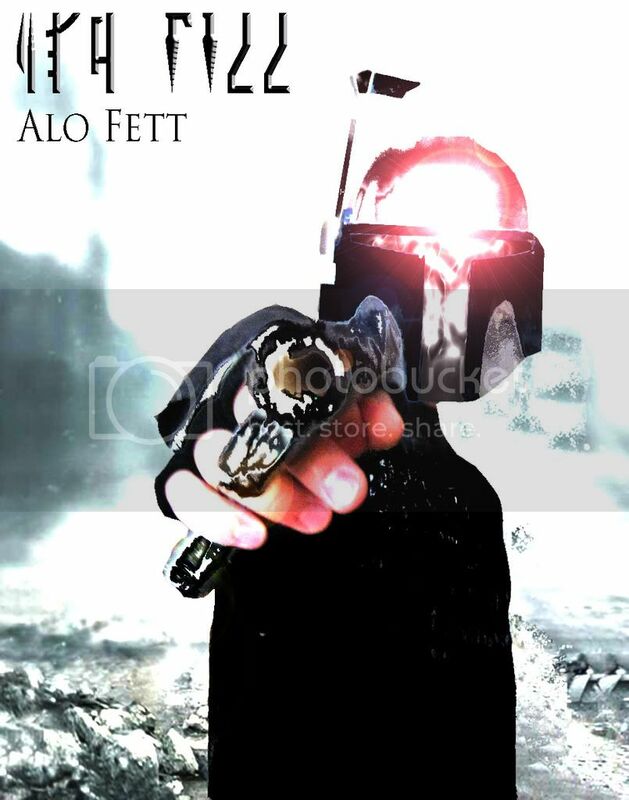 (Start: Alo Fett talked with an old friend that he had known since he was a child, Boba was a distant cousin of Alo and they use'd to play with eachother when there dads were gone on a job. ~beeop~ the holo of 2 merenarys came alive in the cab of the jedi craft "hmm wat have you got yourself into thistime devin ??" "well i better call a person who could probaully find out wats goin on." "well i better get back to that transmission i need to know if A'denla's actually goin after Evan!! "geez devin i told u to stay low and not get to crazy and what do you do land yourself in the galaxys top 3 list of bountys?!?! and who is evan made grumpy this time ???" makes sense. I wanst planing to kill him anyways, that would end the RPG. "Man first a sniper after me what nexted and as i usaully now on other bounty hunters they don t stop after one escape of the enemy. "getting back to the transmission to A'denla telling him of the trando and the sniper wearing black and red mandalorian armor.Also saying thar hed hadnt heard from Evan for a bit. "hmm i think i know who your talking about but im not sure i thought he was dead any way if you can try and contact evan but dont meet youll be like one huge target to who ever is after you"
Kal'ak was in a tight spot. He had to get a hsip, and get of Tatooine. Luckily, he knew just who to threatean. The music was quiet, but the patrons were loud. Kal'ak walked into the bar, unnoticed. 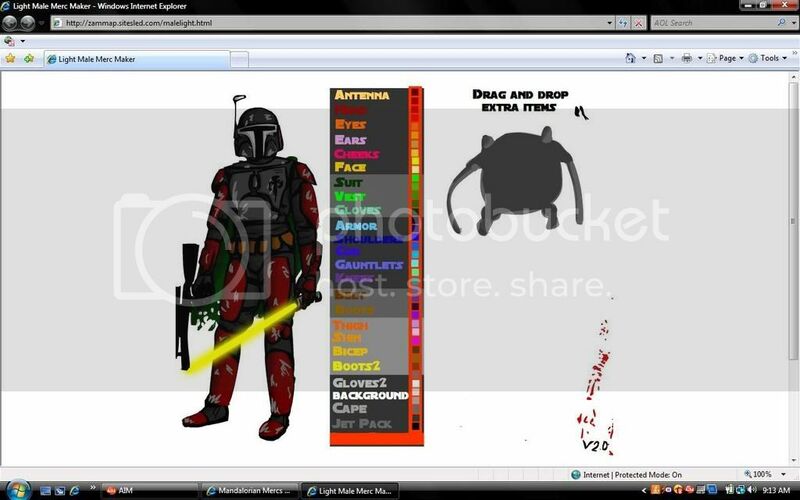 However, Mandalorian armor was rather rare, and he was glanced at by just about every one. A Gran sitting in a booth noticed him. "Oh, shi-"He began but trailed off as Kal'ak entered hearing range. "Kal'ak! How are you?" Kal'ak sat down across from him, and pulled out his pistol, pointing it at the Gran beneath the table "I need your ship." "Well, what are you gona give me for it?" "How bout I let you live?" "Realy, Kal'ak, you shoulddent joke like that, people might start to think your serious." "Listen, you cant do this. I..I can get Imperials on you." "Cut the crap Kree, we both know that you wouldent do that." "What makes you so sure?" Kree asked, looking around. "Because I know, if you did that, some one might come for you. You wouldent want that would you?" As the shuttle pulled into the bay of the Unyeilding the com buzzed to life. The signal was slightly garbled, but that was the price of using Kree's ship. "*static-mandeered*static*HET-*static*-ETTI-*static*ond." Kal'ak got off the shuttle, and had a droid put it on auto-pilot back to Tatooine. He walked to the bridge, sat in his chair after the droid he had left in command got out, and responded. "This is Kal'ak Virtanis of the Unyeilding, who are you?" fianlly a respnse came " i am a'denla mite i ask as to who you are im in search of a friend "